Skyscraper index, campus curse: Apple, Google, other tech giants have huge expansion plans. 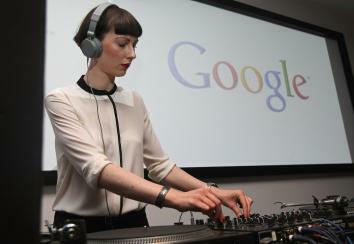 A DJ plays music at the official opening party of the Google offices in Berlin. It comes as no surprise that Facebook, Google, Apple, and Amazon are building huge corporate headquarters—they’re making the kind of profits that often go hand in hand with altering a city skyline. Yet besides needing more space for a growing workforce, the buildings they have planned tell us something significant about the mood of the company. In many ways, architecture is still our most potent symbol of power and longevity, and the sheer size of their projects, the names of their architects, and the prices indicate that our one-time tech outsiders have arrived firmly in the establishment. The skyscraper index is mirrored in Silicon Valley by the “campus curse.” Sun Microsystems Inc. and many others profitable tech companies saw their winning streaks diminish after building lavish corporate village HQs. Facebook’s bungled IPO took place in the same year as the announcement of its new building project. And the curse is now being felt by Apple, whose project in Cupertino, Calif., which resembles nothing so much as a giant glass doughnut, is $2 billion over budget and behind schedule. Some estimate that Apple’s project will eclipse the $3.9 billion being spent on the new World Trade Center complex in New York and the office space will cost more than $1,500 per square foot— according to Bloomberg, this is “three times the cost of many top-of-the-line downtown corporate towers.” Company stock fell about 30 percent last year. Of course, these problems are not the stuff of catastrophe to Apple (apparently it can cover the overbudget in cash). Apple clearly has a confident vision of itself and its aesthetic. Yet given that we all know what capitalist-Randian message is being sent when the Bank of America Tower rises in phallic glory over New York, what does it mean when Apple builds a glass doughnut? Should we be afraid that these extravagant campuses might really burst the tech bubble? But rather than worrying that the companies will soon burn out, maybe we should be concerned that their workers might. Because what these new buildings really embody is the Silicon Valley ethos writ large: For those on the inside, work is life. In fact, with their green spaces, laundromats, and restaurants, these structures resemble nothing so much as self-contained, open plan cities. As some have pointed out, it’s almost a techno-corporate distortion of the California hippie communes of the 20th century. Above all else, these new office plans emphasize the productive possibilities of casual collisions with workmates. That’s what has been written into their design through carefully considered interactive workspaces and shared areas—in Google’s complex, with parks, cafes, and public gathering spaces, no worker will be more than a two-and-a-half-minute walk from any other. Yet there’s little encouragement of interaction with the rest of the world. The inspiration that’s born of serendipitous interactions with outsiders is not built into these primary colored utopias, as employees are encouraged to do almost every function except sleep within company confines. And some may even sleep within a whisper distance of their desk. Facebook announced today that they’re constructing a $120 million, 394-unit housing community a short stroll from the Menlo Park office. We’re left with complete ecosystems and approximations of urban and rural living, for the most part hidden from public view, and constructed in pursuit of drawing maximum productivity from their workers. But will this techno-corporate echo chamber of free coffee and grassy knolls be enough to stave off the “campus curse”?